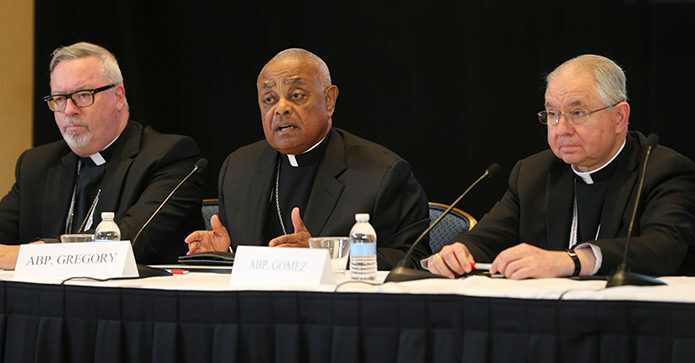 U.S. Bishops Approved “Open Wide Our Hearts: The Enduring Call to Love, A Pastoral Letter Against Racism"
BALTIMORE— The U.S. Conference of Catholic Bishops (USCCB) approved today, during its November General Assembly, the formal statement, “Open Wide Our Hearts: The Enduring Call to Love, A Pastoral Letter Against Racism." The full body of bishops approved it by a two-thirds majority vote of 241 to 3 with 1 abstention. "Open Wide Our Hearts: The Enduring Call to Love," is not the first time the U.S. Bishops have spoken as a collectively on race issues in the United States, but it is the first time in almost 40 years. In 1979, they approved "Brothers and Sisters to Us: A Pastoral Letter on Racism in Our Day." Among the many things, they discussed was the fact that "Racism is a sin: a sin that divides the human family, blots out the image of God among specific members of that family, and violates the fundamental human dignity of those called to be children of the same Father." The newly approved “Open Wide Our Hearts” continues the message that “Brothers and Sisters to Us” sought to convey. The full text, and resources Below - includes a bulletin insert, homily help, prayer materials, background information on systemic racism, and activities for primary, secondary, and higher education classroom settings. Check out the educational resources and parish resources that were created to accompany the pastoral letter against racism. Love Thy Neighbor as Thyself: U.S. Catholic Bishops Speak Against Racism - In 2001, several bishops brought together a series of essays on the perspective of the different cultural families and on racism in general. Their insight remains relevant today and still relevant excerpts, collated in 2013, are available.